Greetings from Gunnison! We’re on a rest day, which I’m quite happy about. I wish you were here so we could go grab a gluten-free muffin and chat about life over kombucha. Perhaps you could also help me look for my bike tour legs, which seem to have fallen out of the Carradice somewhere. My spidey sense told me that yesterday’s ride would be a challenge and it was right on. Having ridden this area before, I recalled the searing dry heat that resides at this lower level terrain. My lips have already blistered because, like Icarus, I tried to fly too close to the sun without adequate lip balm. Okay, maybe not exactly like Icarus, but I did not have enough respect for the New Mexico skies until damage was done. We departed Montrose by the back roads after a delicious stop at Cimarron Coffee – where coffee is a serious experience and I highly recommend going if you ever find yourself in Montrose. 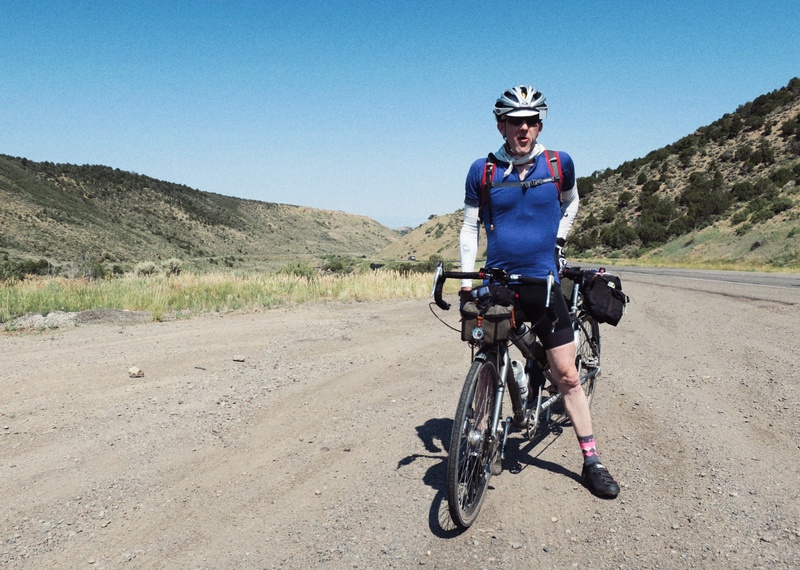 These otherworldly miles of gravel were less than five miles out of town, but were so dry and desolate. I’d see a house here and there and wonder why someone would choose to set up shop in a desert; the Midwesterner in me could not relate. Eventually we merged back with US 50 where headwinds and a steady 8-mile climb up Cerro Summit eagerly awaited us. Traffic whizzed by, and while everybody was nice, the climb up was tough going. 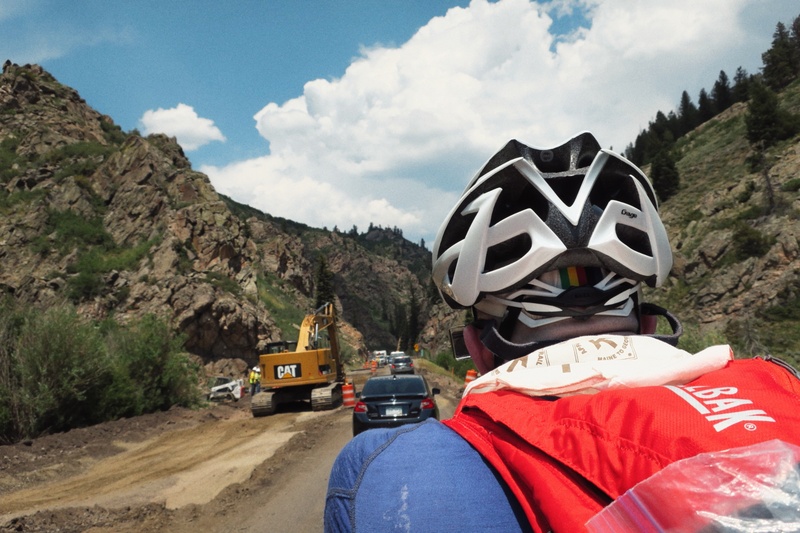 Constantly watching for cars and trucks over your shoulder while you slowly crawl up a mountain detracts from the overall vacation experience. But we knew what we were getting into when we cued this stretch. 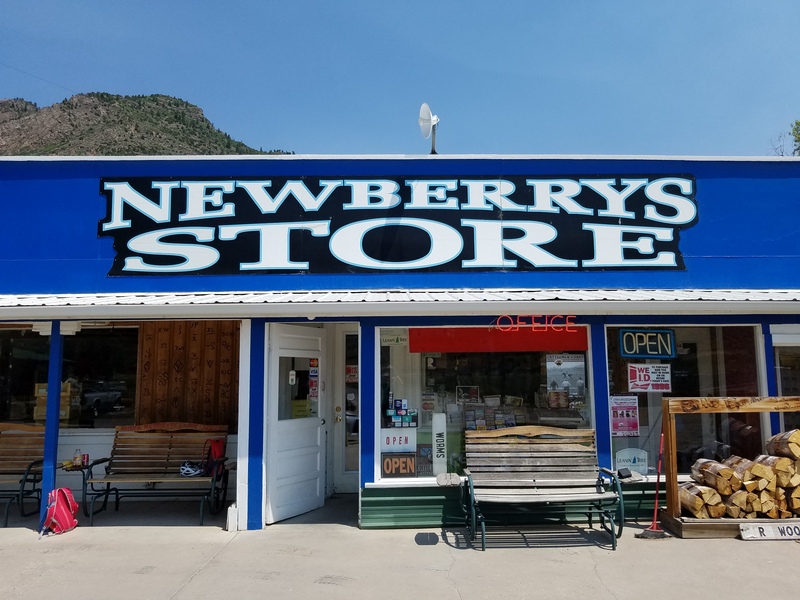 Out east, there are many more back road options to pick from if you want to tour on 32s or 38s. Sometimes you end up on a main highway, but it’s really only as a connector to the next back road. Colorado and parts west just don’t have as many choices when going from Point A to point B, and in order to go all the places we want, we end up on the highway for extended stretches. If I’m wrong on this, please advise. The theme of the morning was sun and wind. Shade, what shade? I suppose living out here you adjust, but I’m practically moulting from the dry heat! Felkerino and I took a couple of breaks on our way up Cerro Summit, hoping to find our bike tour legs. But they had truly gone missing for the day so we had to be patient with ourselves and each other. I was so glad a rest day awaited us. It helped me keep my sense of humor about my vacation. 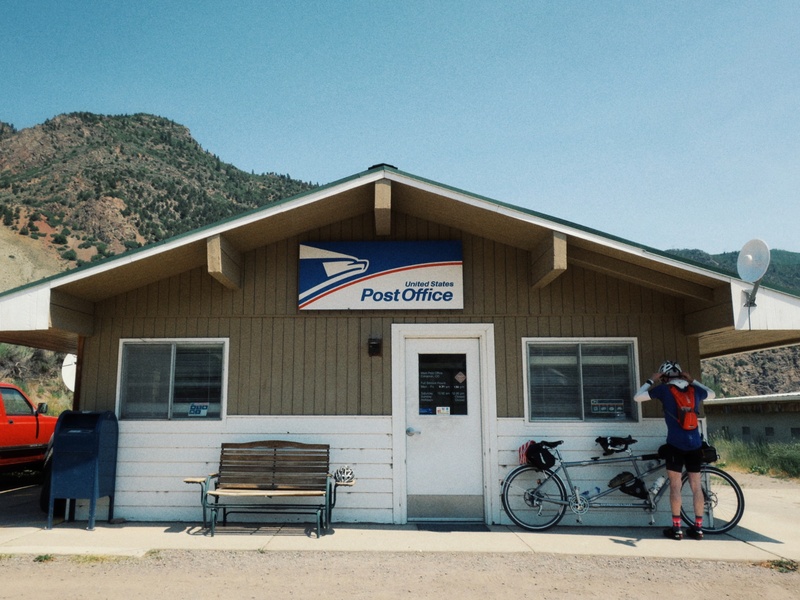 Cimarron Post Office plus shade! The descent off Cerro was a beautiful swoop into more dryness and we stopped in Cimarron for bananas and postage stamps. Dear Mom and Dad, Hating summer camp, please come get me. After a rare shade and banana break, we set out on the ascent once again, this time in search of Blue Mesa Summit. Traffic lightened somewhat over the next couple of hours and we scrambled up to the 8700-foot high point without incident, except for all the biting flies that came out to feast on us when we stopped at the top to reapply sunscreen. You win this round, flies! About a mile after the summit we encountered road work and one of the workers offered us water as we waited in line to pass through a single lane section. The cold water tasted oh so good, and this man’s kind gesture stayed with me over the next miles. It was a sweet bike tour moment. A couple of stretches on US 50 were single lane due to road work, and it added to the slow going of our day, as did a bad link in our chain that started to make itself known after the second climb. The bad link would skip through the derailleur and Felkerino and I were getting pretty frustrated. 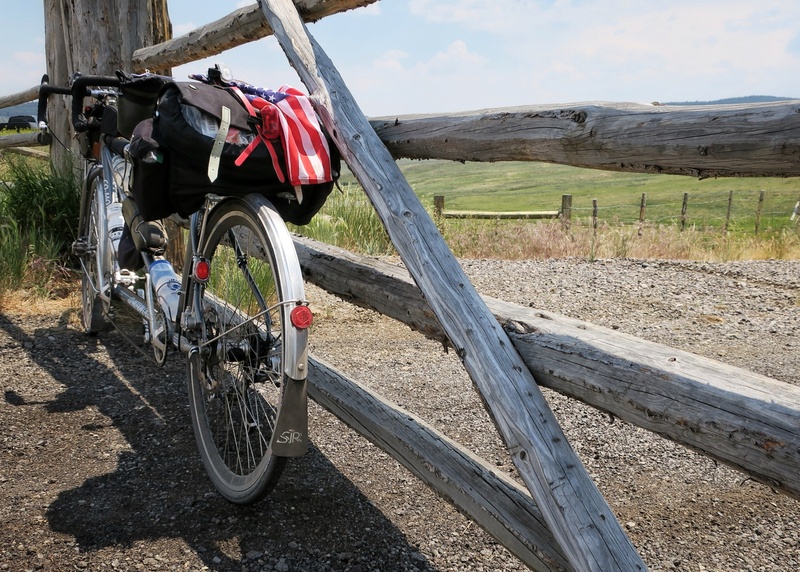 We found a spot of shade near one of the National Park Service restrooms, and that served as a near ideal workspace for fixing the chain, except when the breeze blew just so, and I had to keep my gag reflex intact. Bike touring = so magical! My mechanically adept partner managed to affix a quick link after removing the bad link and we were on our way again. Around this time, the sky clouded over and the sun said goodbye, silly bike tourists. The cloud cover was refreshing after the direct sun blast of earlier, but then wind kicked up and drops of rain began to fall. 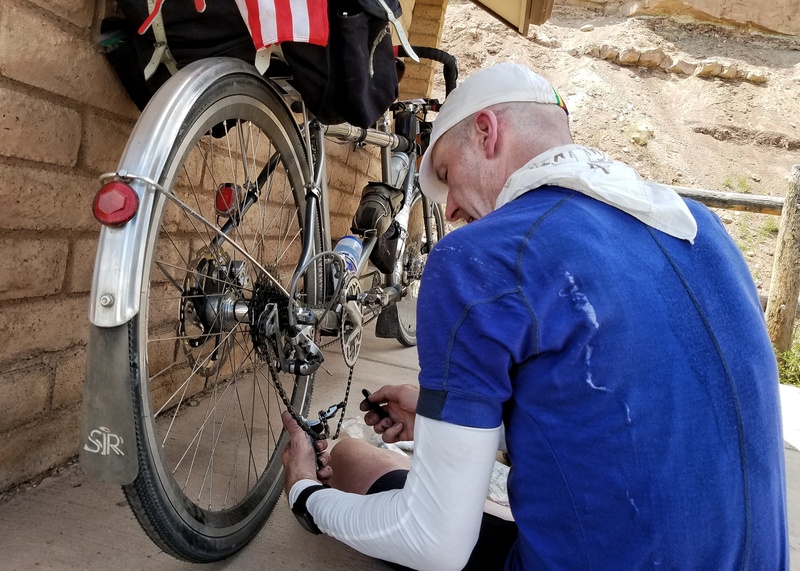 Of course this happened as we were on the final 10 miles and meandering through a canyon, which made the winds blustering through extra exciting on our tandem. 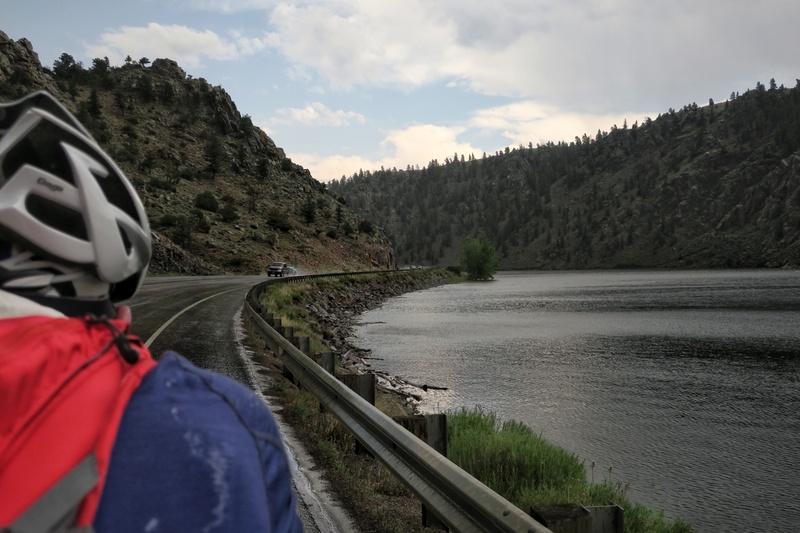 The conditions at this point were uncomfortable but not unmanageable so we pressed on, our bedraggled butts wiggling into Gunnison after 68 miles that felt like more. We headed into the Double Shot Cyclery for coffee and a new chain, both relieved to be in town and off the bike for a day. I put up a Missing sign for our bike tour legs, and sure hope they show up before we leave town again. If you happen to find our bike tour legs, please send them back to us. 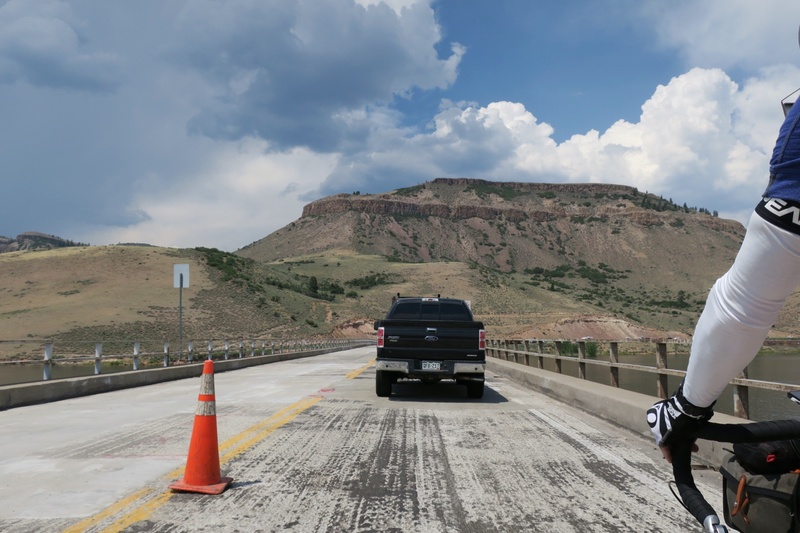 — 38mm tires are good for most Colorado roads unless they’ve gone sandy or muddy (or snowy, but that’s less likely this time of year, though still possible along the divide). I ride 44mm Compass Snoqualmie tires in the summer now for all, from asphalt to dirt road to technical singletrack (though I’d go fat for uber technical like parts of the Colorado Trail or Continental Divide Trail). The 38mm Barlows on my Quickbeam are underbiking for many of these, but suffice quite well. — If you are willing to play with more back roads, dirt, and risk of navigation and things not always adding up, that opens up more circuitous routes and shifts the focus from places with people to places without people. It also means “off” days can have bigger consequences unless you are prepared to camp somewhere, have water filtration, etc. This takes more time and will mean a completely different calibration to your milage, experience, focus, etc., so should not be undertaken lightly. Something to consider is pick out a backroad route to get to your next destination and head there without expectations (which can so easily become premeditated disappointments. Grin.). 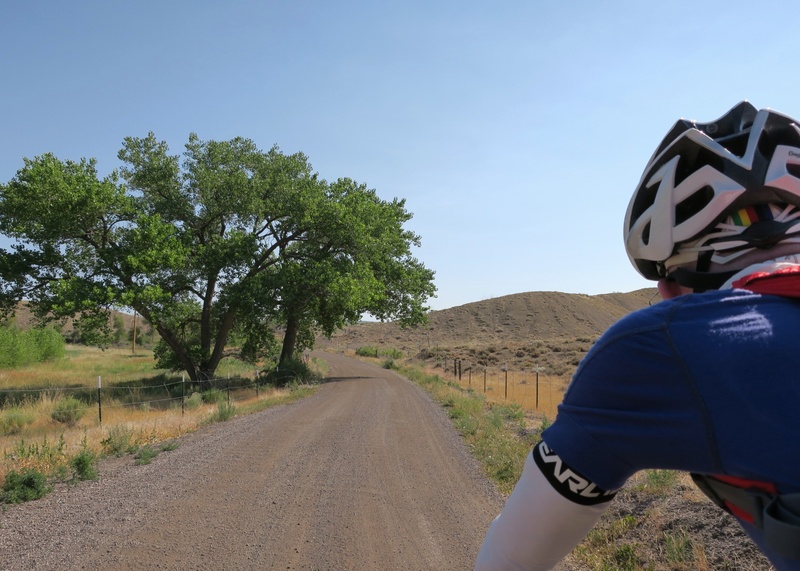 You’ll learn a lot, likely including how to do the backroad thing, what could be better, or that you prefer to put up with the main arteries for extended sections. By the way, a combo of maps is needed for this, including Benchmark Colorado Atlas, Trails Illustrated, and local information. And even then there are some stunning headscratchers and navigational adventures! Grin. Makes sense. Thanks for the feedback and for following our trip! The arid climate is definitely an adjustment! Thank you for your kind words. 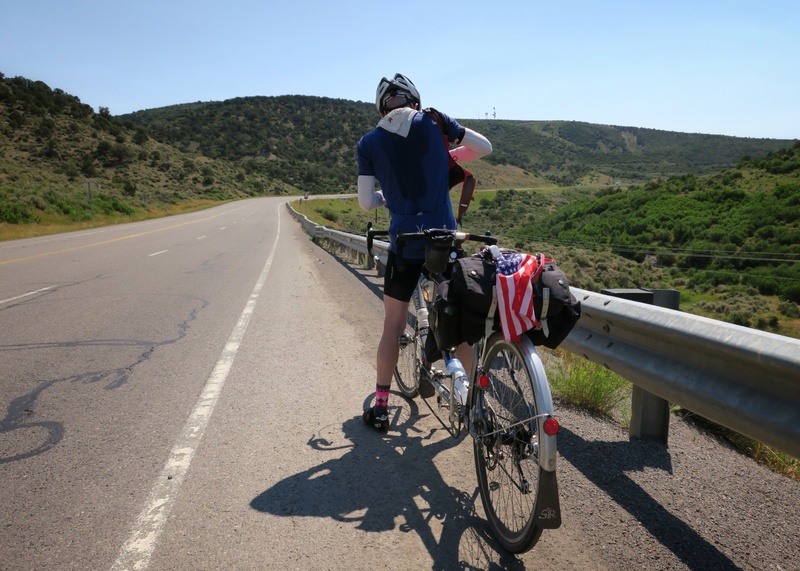 I really think riding brevets has helped with our approach to touring. Also, I wondered how cyclists keep riding through AZ summers. That is serious heat. Repeat after me: I am having fun. I am having fun. I am having fun. Your legs will return. As for me, 101 flat miles nearly killed mine today. I can’t resist at least one Whites Ferry loop ride each year. Thanks for your update as I am enjoying reading them. I could feel your pain cycling up that mountain as I read it. I am a far inferior cyclist to you as I have not cycled the distances you do but boy do I find climbing hills tough let alone mountains. They say there’s no shame in walking and of cause there isn’t but who said we are cyclists so we cycle even when it’s easier to walk. Fingers crossed you get no more mechanical problems. Stay safe. Thanks Ted! No walking yet, but we have learned that it is possible to climb on the bike at 4 miles per hour, which is really walking speed! I love every bit of this. Feeling SUCH empathy! It’s so good to know that my dark thoughts about bike touring when I’m in the midst of it are not unique to me. I figured that everyone else was having a blast 24/7 and I just wasn’t “getting it.” But those moments like the road guy who gave you cold water? And the views when you get someplace that people in a car would just whiz through? Priceless. Keep it coming, Mary! Before I finished reading this I had to turn my ac down a degree or two. Thanks to you both for following along. I get so much out of trying to do a quick summary of the day while it’s all fresh.